The Carnival weekend is approaching. 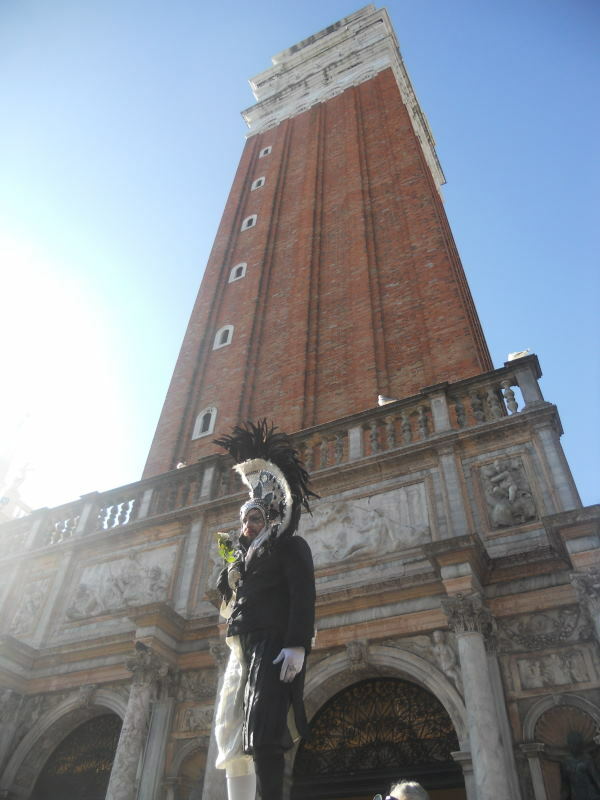 In the evening public water taxis go up and down Canal Grando in Acqua alta and passengers under masks in decorative and extravagant costumes. They couldn`t wait for the weekend to go undercover. 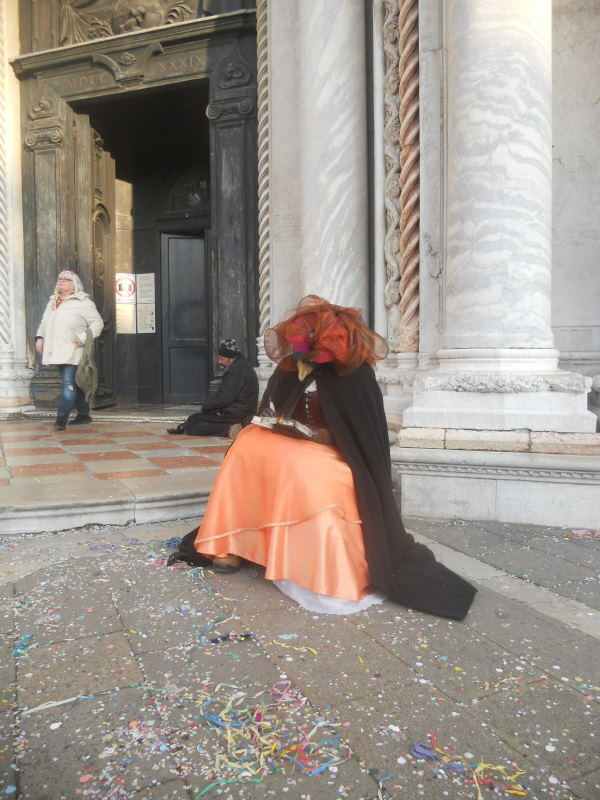 Laughing and taking pictures of each other, this group is impatient to get off at San Marco stop and enter one of those party buildings, some of which are hotels “masked” into mysterious castles that allow only VIP guests. Lights along the canal look like fire torches at night. Lorenzo Quinn`s “Hands holding building” rise from the canal. The sculpture`s white grasp warns about climate change. 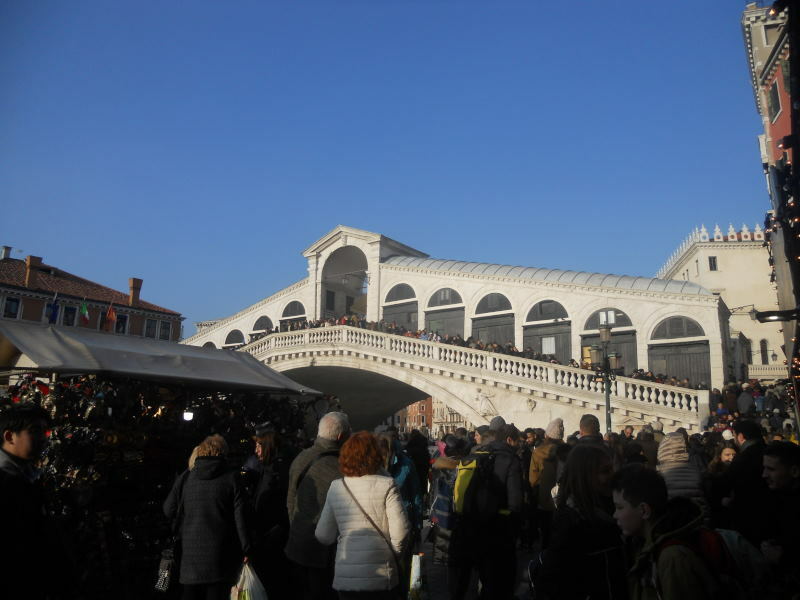 The Rialto Bridge shines out its whiteness for those passing under it and moving further on board a ferry. 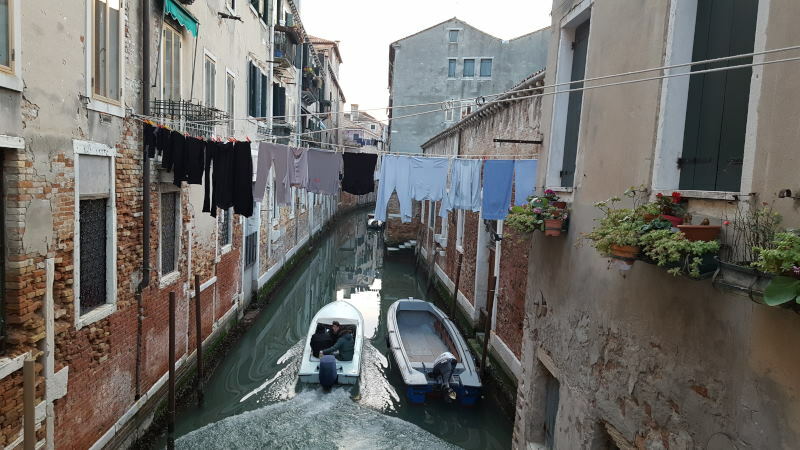 The next morning, while laundry is hanging and drying in hidden courtyards, somebody might take back exit of the patio by boat – that is the only way to exit as canal water is all one can step into if moving on this path. 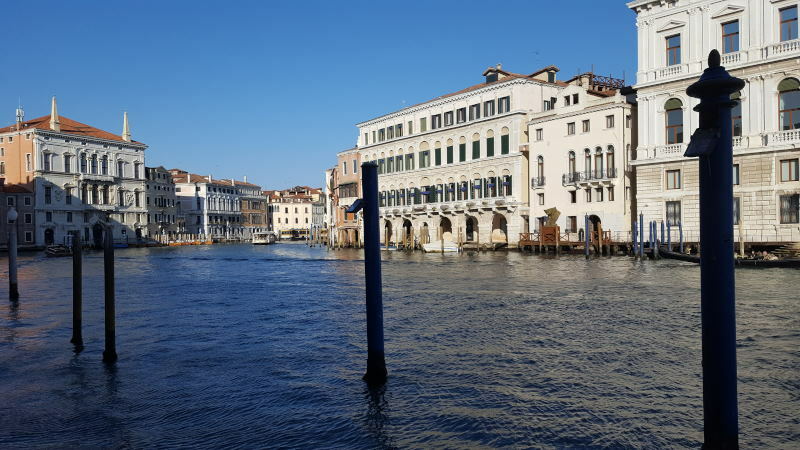 Close to the Arsenale ferry stop, the sun is shining with all its force and they are serving breakfast at a local cafe – fresh pastry, toast sandwiches, cappuccino and – prosecco. 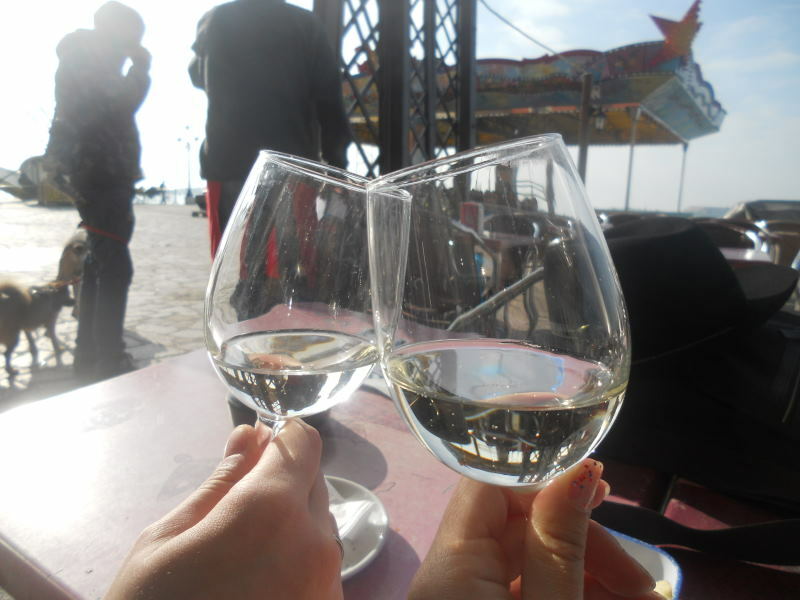 Every morning local guests gather around the bartender and sip their yellow and red spirits, looking through the big window out at the pier, checking out people that are passing by. Soon the professional actors/models will appear close to the canal, dressed up in rich ball costumes and faces hidden under cat eye masks. 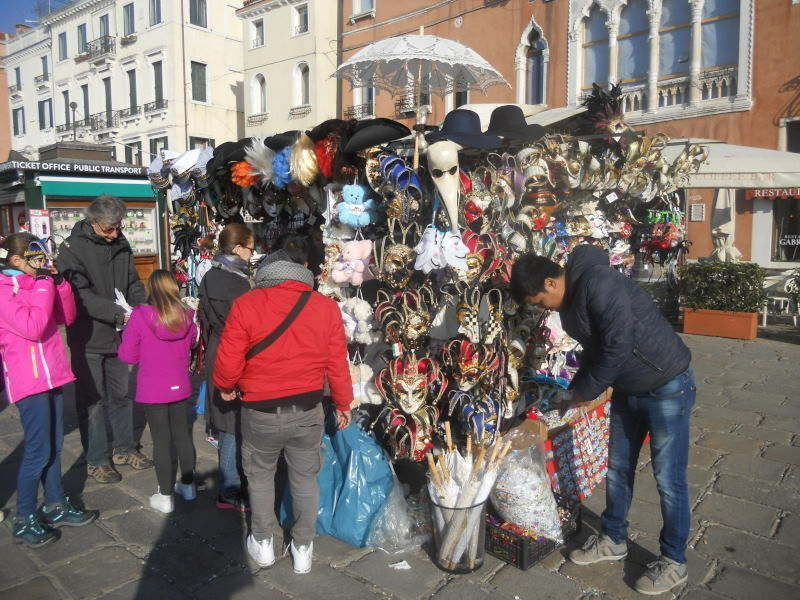 Some will have a sign nearby saying that it is allowed to take photos of them free of charge – they just want to introduce Venice during its February tradition. 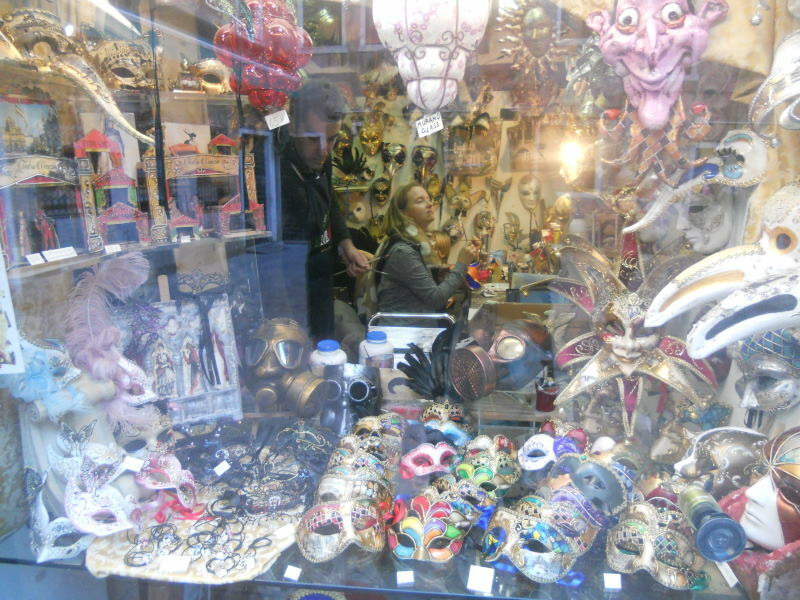 Not so far away, numerous booths are selling all kinds of masks of varying quality – another way of promoting the carnival and taking advantage of mass tourism. A syndrome that spreads in many world cities today (and causes locals to raise their voices against it). In any case, this early spring morning that is slowly moving on in such a unique place as Venice makes many people enter another world: a world of dance, performance, art, fantasy, poetry, romance. 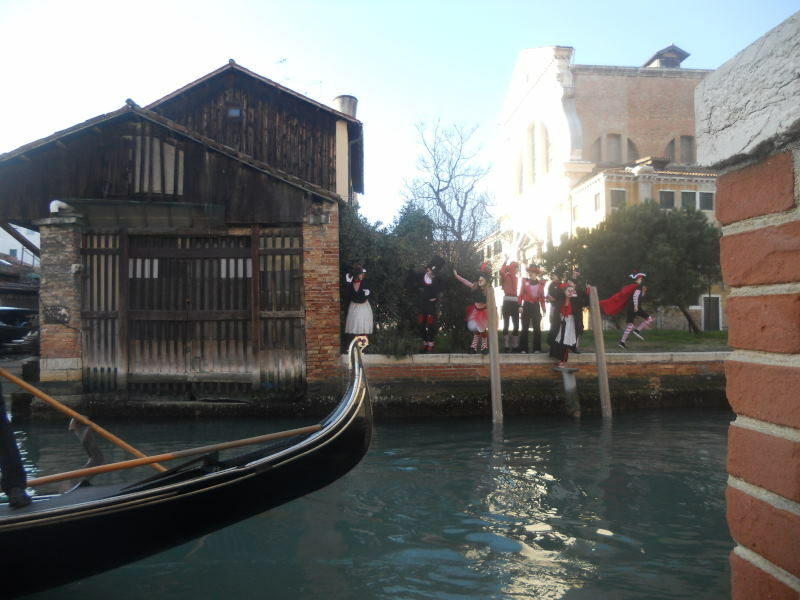 As the afternoon approaches, those that can afford ridiculously expensive few hours in gondolas, together with standing rowers in sailor striped t-shirts, end up on photos of the majority that stands on the bridges above the canals. The crowd seems to buzz constantly in this floating fairytale (how else to call it, with all these unreal fashion, hidden faces and dreamlike architecture wherever one turns?!). 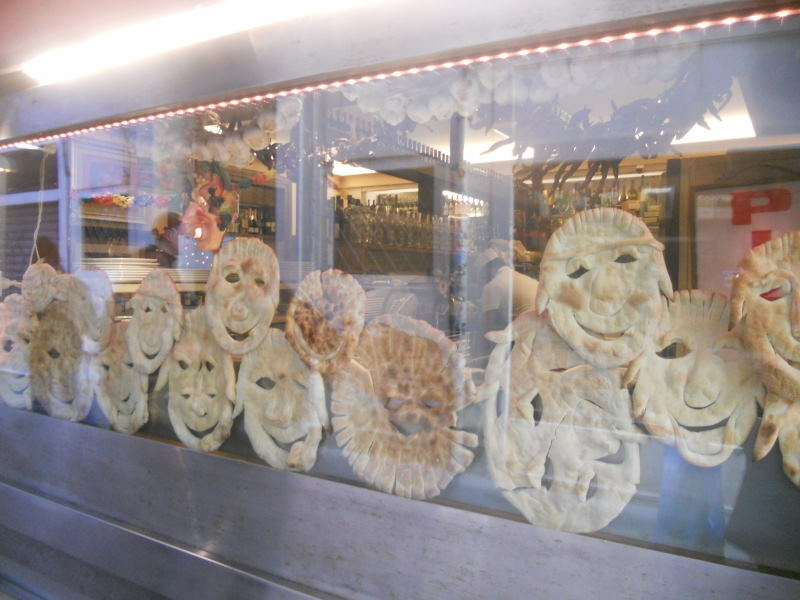 As people move on, from one turn to the other in this cobblestone labyrinth of Venetian passages, some very creative moments can be spotted: bakery -making “flat bread – faces” and hand-made masks, right there, on the spot. The artists use their creative fingers and brushes and present their skills. 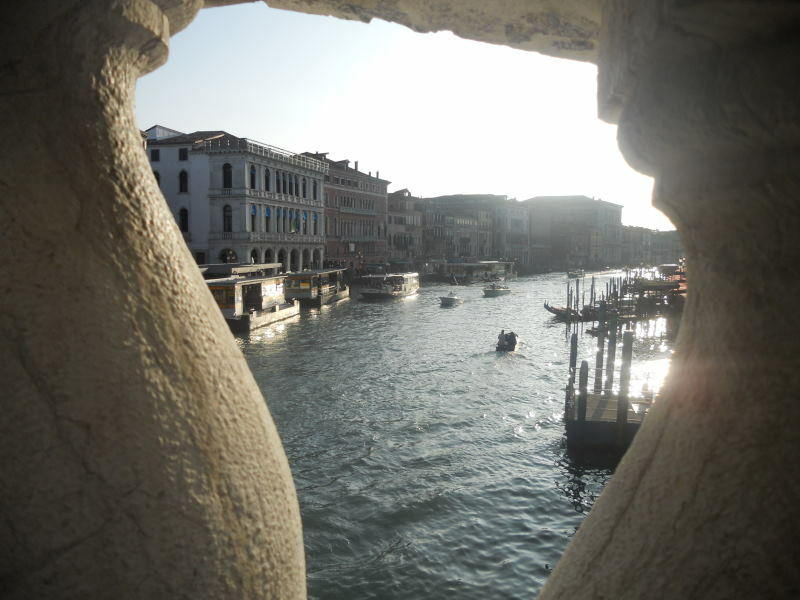 No worries if you get lost-these tall buildings and narrow passages often show signs such as Per S.Marco – yup, that`s where you`re heading. Amazing architecture. It is enough at any time to follow with your eyes any long wall upwards, and there is always this amazing shot you can take: arches, ornaments, old window sills, Venetian blinds,or simply the combination of the building top and sky (whatever they look like!) 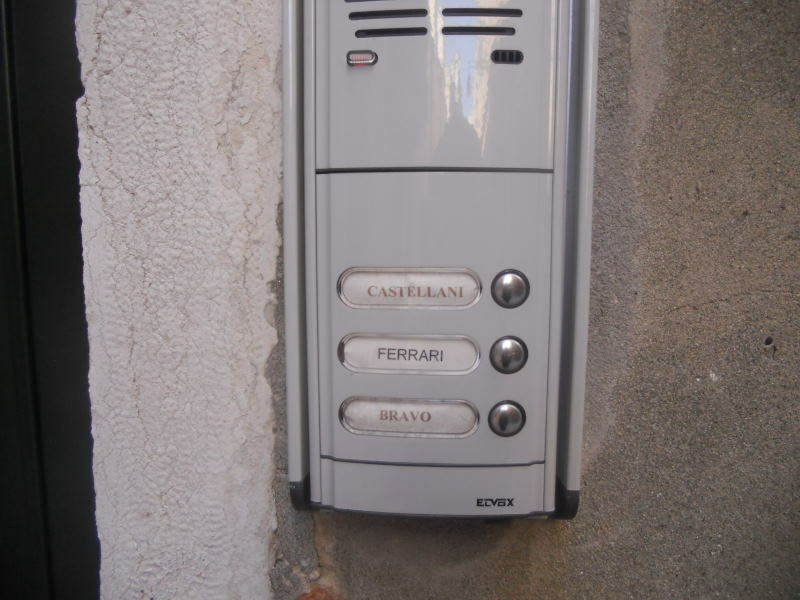 Those families, Ferrari and Bravo, who have their names on one of the intercoms in the area, must have a good life. 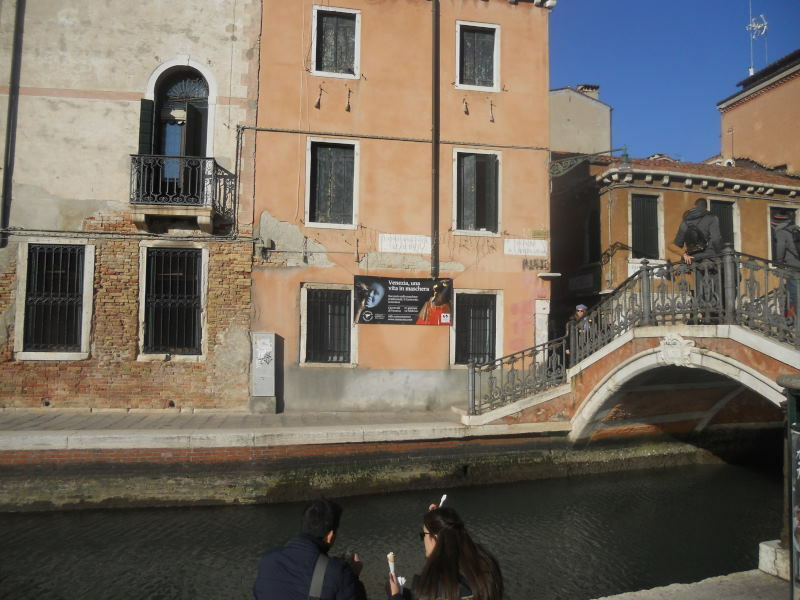 On the other side of the canal, in the area or sixth (sestiere) of Dorsoduro, students and youth makes a line in front of a popular local bar. here is discounted drink served with cheap tapas and the only thing missing are couple of more tables to accommodate all the hungry guests. Otherwise, the stairs by the canal will do the job – as long as it is not too slippery to bend and rest the tired legs while sitting on them. Across the water, there come youth performers in their costumes and masks and entertain everybody around with their dance and tricks. The afternoon sun moves slowly over the sky and as the dusk approaches, it is time to cross the bridges again and, via colourful spice and food market, find some cozy pizzeria to have evening meal. 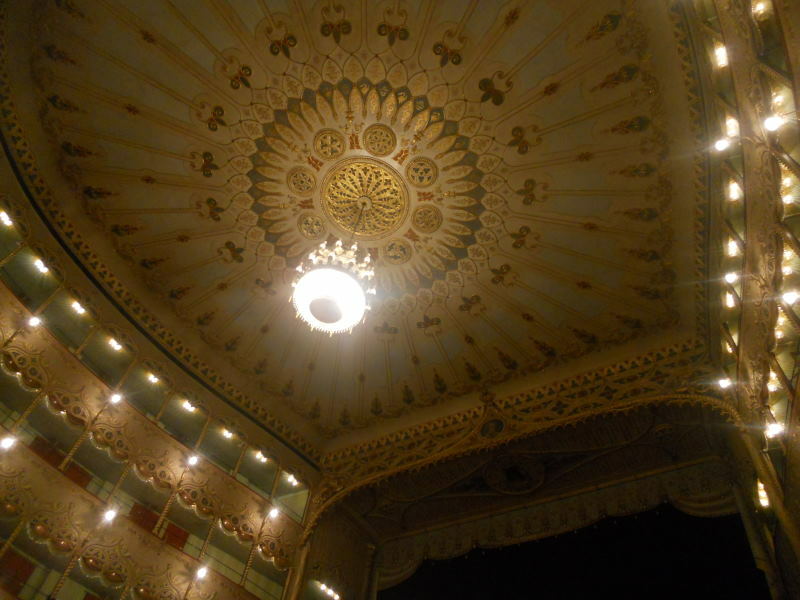 As it darknes, there is a “show in a show”- a play at Goldoni Theatre: raging Arlecchino (“Arlecchino furioso”) is trying to win back his long-lost love in several languages (so that everyone in audience is included) in this comical performance. 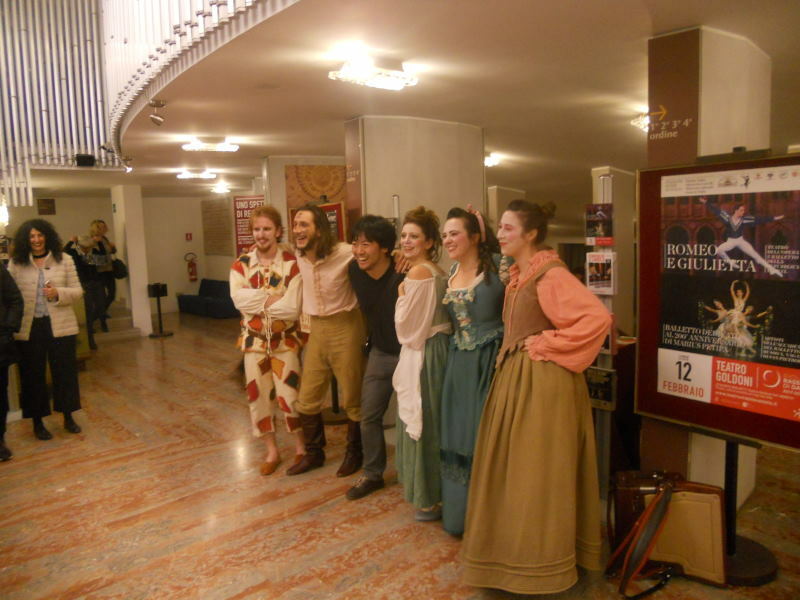 After the show, tired but kind actors come down and meet the audience. Everyone smiles – they did a great job. 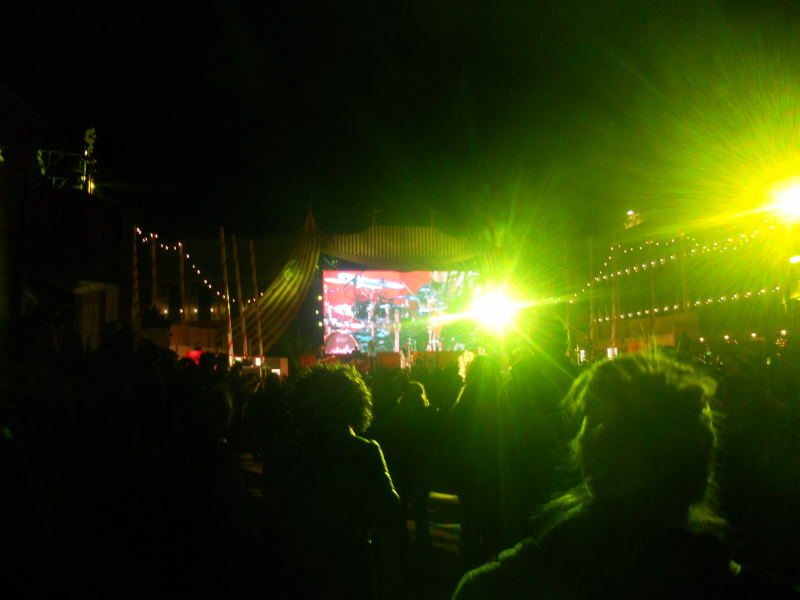 This night, a pop band performs a concert at Piazza San Marco and people stand in line to get some of their favourite drinks in plastic cups and jump to the music. The next day it is impossible to take usual route along the riviera: the police has closed down the main road and is asking everyone to stand in two lines and open their bags! 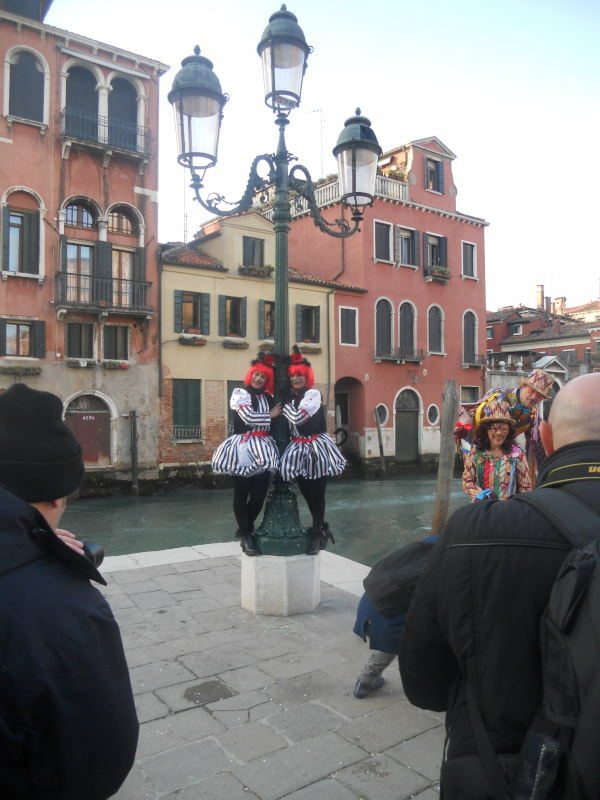 And they all comply, just to get by 10.30 to San Marco Square and see the Flight of the Eagle. A brave citizen takes his “flight”, hanging on the rope over the square, from the church clock down to the stage. There he will press LOVE (or WORLD PEACE) button, together with big head masks of famous world politicians and send thousands of red hearts into the air that will soon after that cover the thrilled crowd and the square ground. All of that in the rhythm of the song – “All You Need is Love”, of course. 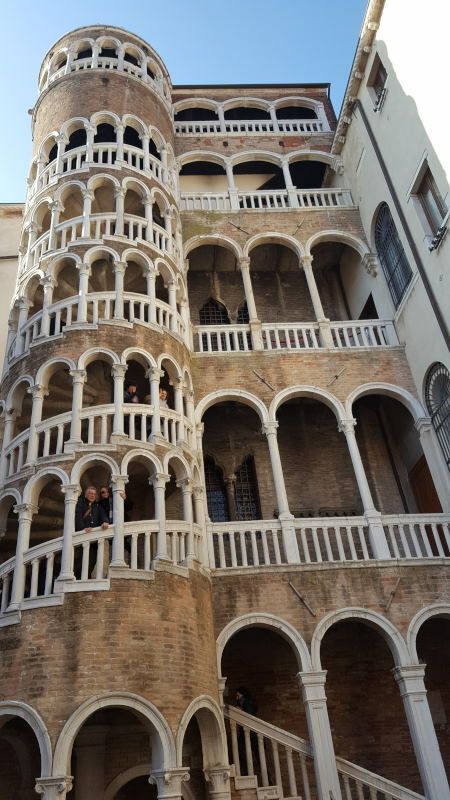 So positively inspired, the city guests move on through the streets in Castello, the biggest sestier, in search of the famous spiral staircase Scala Contarini del Bovolo – the city`s tallest. From its heights they get a nice panorama of Venice`s rooftops in early spring sunshine, but also a bird-view of a lovely courtyard beneath their feet. In the meantime, the square Campo de la Celestia is empty this afternoon. Suddenly, two nuns appear and quickly pass by. They cross one of the bridges that has a locked chain at the beginning of the stairs and soon disappear behind the cloister walls. It is pleasant to walk in the shade of tall buildings and rest eyes from the strong sunshine for a change. When reaching the southern bank of the Canal, one can admire the view of the basilica Santa Maria Della Salute across the water. 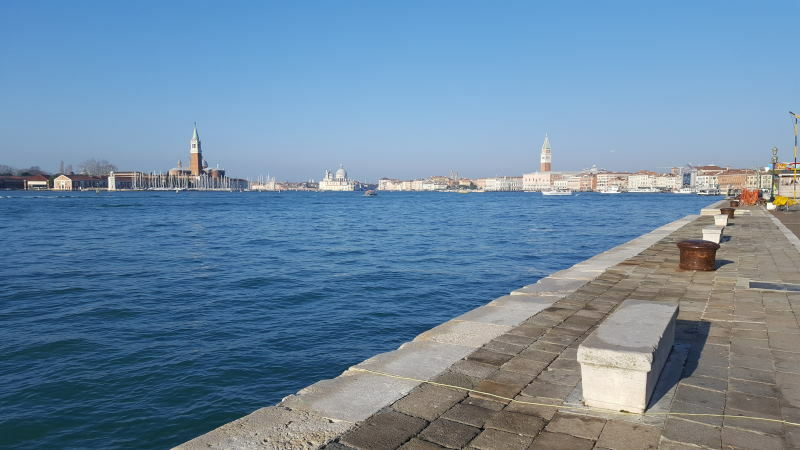 The northern one shows an island in the distance: Isola di San Michele, one of the 118 islands in Venetian Lagoon, is a resting place for the soldiers that died in World War I. From the distance, the long island wall reflects golden colour and mirrors itself in the water. Sense of peace, history, (im)mortality and some unsaid wisdom is present. Some blocks away, a model dressed up as a geisha is posing for he photographer. 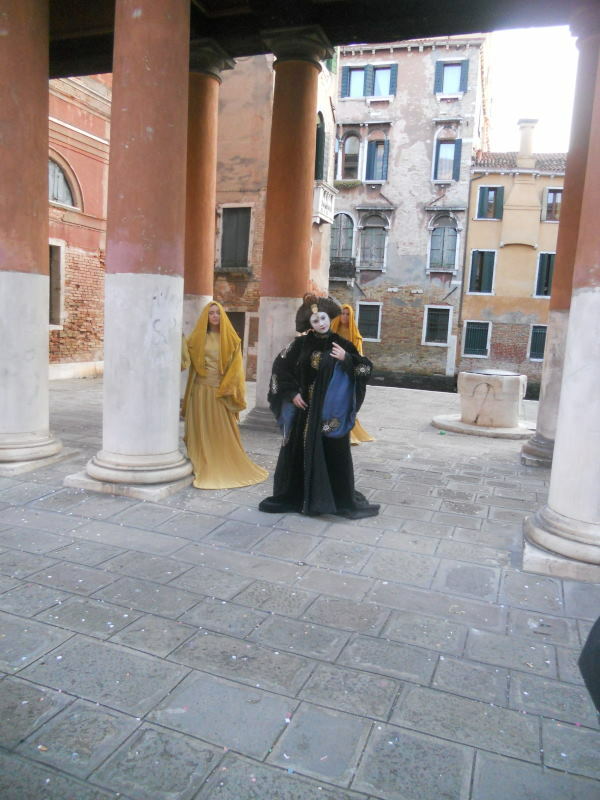 Two ladies accompany her in making different postures on the Venetian stone square and bridge. The afternoon moves on and there is a stage being prepared on San Marco Square; tonight tango dancers show their skill to round up the festivities. Posters are put up and there is one more gathering of joyous crowd before packing the masks for the next time. Later at night, Venice streets seem unusually quiet. Most of the people took the masks off and show their real faces (or so it seems). 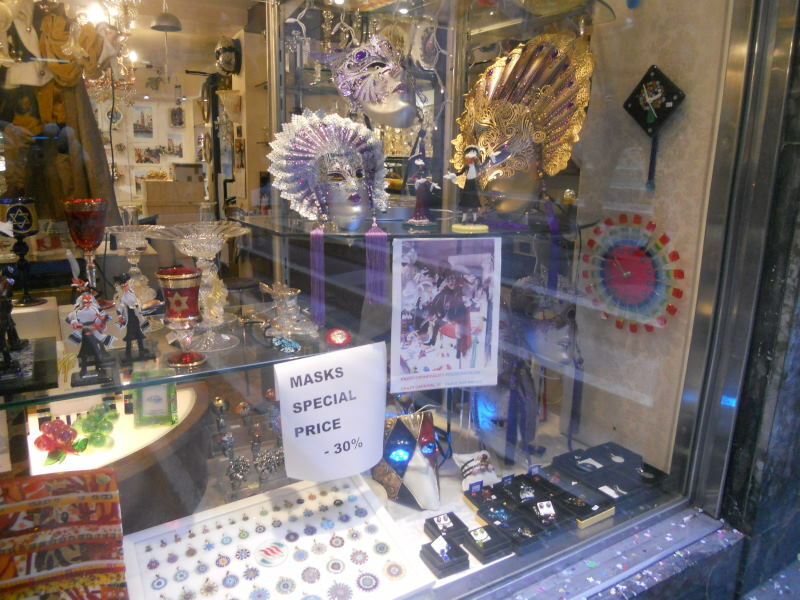 Some shops do not give up: they give 30% discount on masks, hoping to start fresh with new products next year. 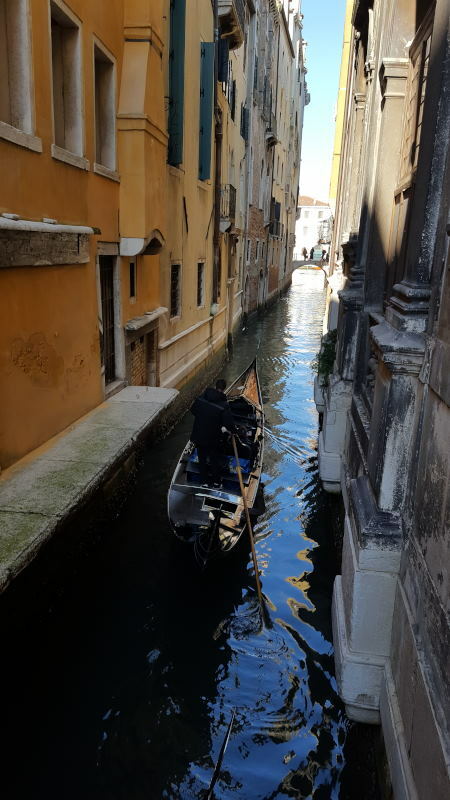 And as the water ferry takes passengers over the canal so that they could catch their airport bus in time, some choose one of those beautiful wooden taxi boats, which Venice is famous for. 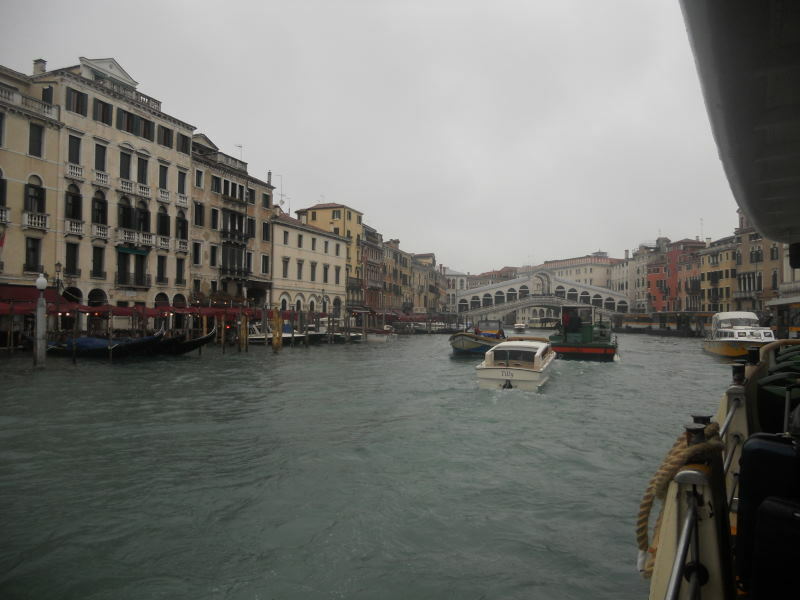 Only two are not used at the moment – docked in front of Santa Maria della Salute, they wait their passengers and warm season that is about to start.